God does amazing things when we choose to be obedient. From the beginning, Sol's founder, Tonya Wells, has been passionate to help children become confident readers. Reading is the foundation to everything a child will do. If we can increase a passion for reading, we are succeeding! In 2018, thanks to a grant from the Henry County Board, Sol's Legacy piloted a reading program to specifically target children who are struggling with reading in the classroom. At the time we announced our start date, Tonya connected with Dr. Michele Pickel who created Horse Powered Reading. It was as if God opened a door for us to start this program. Horse Powered Reading was developed in 2012, by Dr. Michele Pickel. It combines activities utilizing a horse and the use of research-based reading strategies that engage the mind, body, and emotions in learning. Dr. Pickel was a great source of knowledge and help by sharing activities and strategies to enhance our program. Tonya completed Dr. Pickel's Intro to Experiential and Horse Powered Reading Instruction online class. This program was a success! 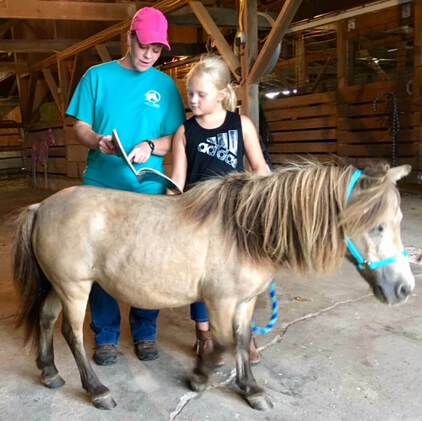 In 2019, we are offering 14 opportunities for children in grades 1st - 3rd who struggle with reading to experience the amazing connection with our horses and how this bond can encourage reading. Sessions are private and will last 45 minutes for 5 consecutive weeks. Sessions fees are $75. Scholarships are available on a per session basis for students needing financial assistance. Please contact Tonya Wells for more information on our reading program.